You can customize your ceremony to fit your needs. Attentive staff will personally ensure your ceremony is a beautiful, professional and memorable experience. This package includes your choice of chapel, use of Bridal Suite, music and witness. Upon arriving at A Chapel of Love you will select from a choice of 3 chapels. Choose from a selection of premium wedding enhancements and choose your music. Afterwards, the bride will be able to get ready in a luxurious bridal suite. Finally it's time for your ceremony, the minister will join you and your significant other in holy matrimony. 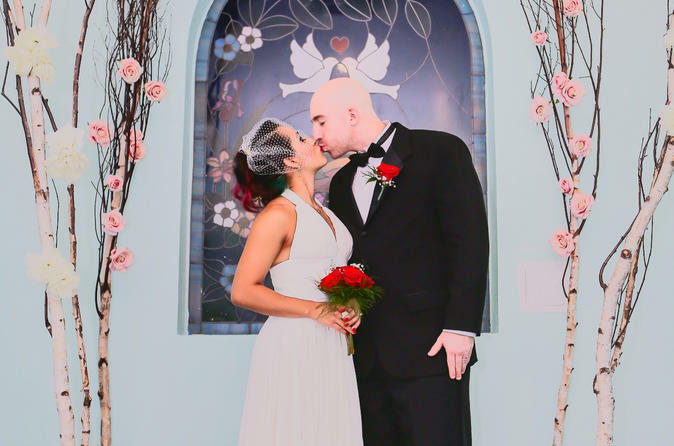 A Chapel of Love was founded on the principle that everyone deserves a beautiful ceremony on their special day, whether it is a civil, religious, commitment or renewal of vows. The mission is to give you everything you want and nothing you don't. You can customize your ceremony to fit your needs.